1 “Surely the day is coming; it will burn like a furnace. All the arrogant and every evildoer will be stubble, and that day that is coming will set them on fire,” says the Lord Almighty. “Not a root or a branch will be left to them. 2 But for you who revere my name, the sun of righteousness will rise with healing in its wings. And you will go out and leap like calves released from the stall. 3 Then you will trample down the wicked; they will be ashes under the soles of your feet on the day when I do these things,” says the Lord Almighty. Not specified in the Bible. The sun provides lighting for this scene, from above. There is a glow from the fire that illuminates the billowing smoke with red/orange light as well. Two un-named Hebrew shepherds, a man on the right & a woman on the left who has opened the pen door to release the calves. I have enjoyed drawing & colouring up this scene! I like the calves leaping about & the smiley expressions of the two people releasing them from their pen. Notice the fire in the background, which relates to the “furnace” ov verse 1. Notice also the stubble on the ground, which is being trampled by the calves hooves. 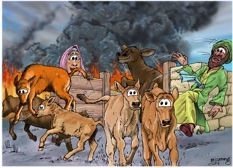 The calves & people do not have concerned or worried expressions, because they represent God’s faithful remnant & so they know that the fire of His wrath is not directed towards them, but towards the wicked of the earth. The man is falling backwards with a laugh, as the calves leap in excitement at their release. The woman who is behind the gate, is smiling too at their energy & the man falling! 2 But who can endure the day of his coming? Who can stand when he appears? For he will be like a refiner’s fire or a launderer’s soap. 3 He [God] will sit as a refiner and purifier of silver; he will purify the Levites and refine them like gold and silver. Then the Lord will have men who will bring offerings in righteousness, 4 and the offerings of Judah and Jerusalem will be acceptable to the Lord, as in days gone by, as in former years. The judgment on the day of the Lord is described as a judgment of fire, but this is not a destructive, out of control fire that destroys all & everyone. It’s purpose is two-fold: one the one hand it refines (is designed to purify the Levites – as is clear from Malachi 3:3) but on the other hand it destroys the wicked. 17 “They will be mine,” says the Lord Almighty, “in the day when I make up my treasured possession. I will spare them, just as in compassion a man spares his son who serves him. 18 And you will again see the distinction between the righteous and the wicked, between those who serve God and those who do not. 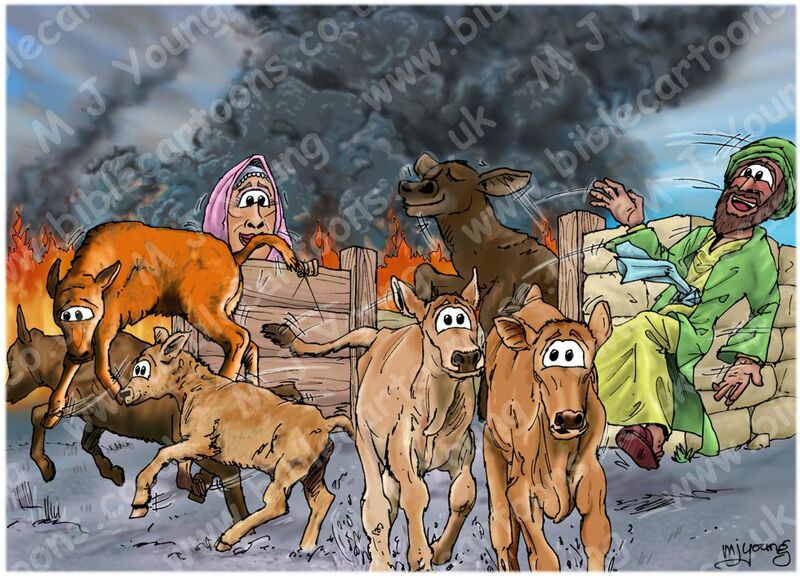 Because of this difference in the fire’s purpose, I have drawn the calves leaping & the people smiling, even though there is a great fire & billowing smoke in the background. I wanted to illustrate the assurance & confidence that God’s chosen, remnant people can have, even when a raging fire goes on all around them! Verse 4:2 uses the phrase “the sun of righteousness”, but apparently it only occurs in this verse & nowhere else in the Bible. Many commentators have thought that the phrase refers to Christ (the Son of Righteousness), which may or may not be correct. Certainly Healing (marpēʾ (Hebrew) “health or restoration”) in its wings (or rays) would seem to refer to the restorative power of righteousness; rather like the health-giving rays of the sun. Clearly God’s remnant, chosen people will be spiritually restored & renewed. The metaphor of calves leaping for joy at being released in a pen (stall) expresses the future joy, freedom & satisfaction of the righteous. That was also my intention in developing the expressions on the calves’ faces! The last verse (Malachi 4:3) refers to the righteous remnant trampling the wicked (now rendered to ashes) under foot… or hooves, if we continue the calf metaphor! I have made the ground under the calves purple grey to look like ash. The finality of the judgment on the wicked is obvious from this verse. More subtly perhaps, it also explains & answers the cynical question asked by the unfaithful Israelites “What do we gain by carrying out God’s requirements?” in Malachi 3:14 – we gain a vast amount! Or Almighty, “my treasured possession, in the day when I act. “[Wait] for the day when I rise up as a witness [against the nations]. 2 Many of those who sleep in the dust of the ground will awake (resurrect), these to everlasting life, but some to disgrace and everlasting contempt (abhorrence).